Developing and implementing strategy is the central task of a leader, whether the CEO at a Fortune 100 company, an entrepreneur, the head of a school, or a government official. Richard Rumelt argues that there has been a growing and unfortunate tendency to equate fluffy packages of buzzwords, motivational slogans and financial goals with "strategy". 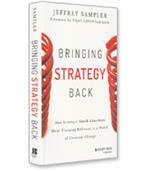 He debunks these, and other, elements of "bad strategy" and awakens an understanding of the power of "good strategy." The problem for many companies today, according to longtime strategy expert Richard P. Rumelt, is not simply a lack of a good strategy. Because of misconceptions and leadership dysfunctions, companies are pursuing an explicitly bad strategy. 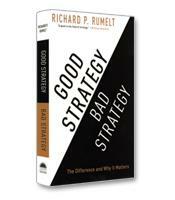 In his new book, Good Strategy, Bad Strategy, Rumelt describes the tell-tale signs of bad strategies for which leaders should be on the lookout: fluff, that is "gibberish masquerading as strategic concepts" that uses buzzwords to restate the obvious; failure to face the challenge; mistaking goals for strategies; and bad strategic objectives that fail to address critical issues. In contrast to bad strategy, writes Rumelt, all good strategy has a basic underlying structure — which he calls the "kernel" — that contains three elements: a diagnosis, a guiding policy and a set of coherent actions. The diagnosis summarizes and simplifies the challenge facing the company or the organization. When Lou Gerstner took over IBM, most observers believed the company’s skills in integrated computer services were obsolete; as the industry moved from mainframe to desktop, it had begun to fragment into a myriad of small suppliers of hardware and services. Gerstner turned IBM around by rejecting the conventional wisdom. His diagnosis: The computer industry could still use IBM’s unique integrated skills, but IBM had failed to learn how to use these skills effectively in light of the changes in the industry. In other words, his diagnosis was that IBM was not integrated enough. The guiding policy is the overall approach that will be used to meet the challenge identified in the diagnosis, Rumelt writes. A guiding policy is not a set of goals or a vision for the strategy. It does not say where the company wants to go; instead it gives some general rules or guidelines for helping the company meet the challenge. IBM’s guiding policy for its new strategy was to draw on all of IBM’s resources to solve customer problems. Once the diagnosis has been made and a guiding policy established, a set of coherent actions is designed to implement the guiding policy. Too many people, Rumelt writes, mistake the guiding policy for the strategy and forget the action element. Based on the guiding policy, the company must take specific coordinated steps to put the policy in action. At the heart of identifying a good strategy is what Rumelt calls "discovering power." 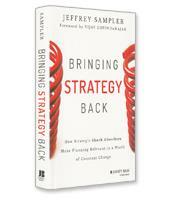 The best strategists, he writes, bring a fresh perspective that uncovers the untapped power of the organization. In short, writes Rumelt, "a good strategy works by harnessing power and applying it where it will have the greatest effect." One of the most striking examples of developing a strategy based on discovering power is provided by the Cold War. Until 1976, Rumelt writes, the military strategy of the U.S. against the Soviet Union was reactive. Every year, the Joint Chiefs of Staff developed an assessment of the Soviet threat and then created a shopping list of weapons based on that threat. In 1976, two military strategists named Andrew Marshall and James Roche proposed a new strategy: Instead of reacting to the Soviets, the U.S. should compete with the Soviets, using its superior technology and economy to force the Soviets to spend their scarce resources on countering the U.S. When the Soviet Union eventually disintegrated in the early 1990s, the country had gone broke economically, politically and militarily. It was overextended, thanks in some part, Rumelt believes, to the "competitive advantage" strategy advocated by Marshall and Roche. In the second part of the book, Rumelt dedicates a chapter to each source of power: leverage, proximate objectives, chain-link systems, design, focus, growth, advantage (exemplified above), dynamics, inertia and entropy. Rumelt notes that the list is not exhaustive. These are only a selection of the sources of power available to strategists. Good Strategy, Bad Strategy is packed with case studies, many drawn from personal experiences of the author, that fully support this comprehensive, no-nonsense tool-kit on strategic thinking. Leaders will learn not just how to develop an effective or "good" strategy, but, just as important, how to recognize when they have implemented a bad strategy.